MIRACLE FOOT BRUSHTM is an ultra long foot brush that reinvigorates the skin by deeply cleaning and exfoliating. 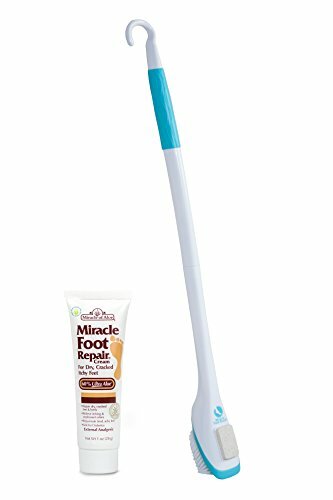 The MIRACLE FOOT BRUSHTM brings all the pleasures of a foot treatment from a spa to your front door. Don't go to expensive day spas and stop straining your back to clean your feet with a bar of soap. The MIRACLE FOOT BRUSHTM is the inexpensive and easy way to maintaining smooth and healthy feet. The MIRACLE FOOT BRUSHTM has a no slip grip for easy handling and a hook so it can be stored right in the shower. It also features long deep cleaning bristles great for those hard to reach spaces in between the toes also coupled with a pumice stone attachment to scrub any unwanted dead skin or calluses. Also unlike its competitors the MIRACLE FOOT BRUSHTM can be split into two parts perfect for packing and on the go. If you have any questions about this product by New Product Solutions, contact us by completing and submitting the form below. If you are looking for a specif part number, please include it with your message.